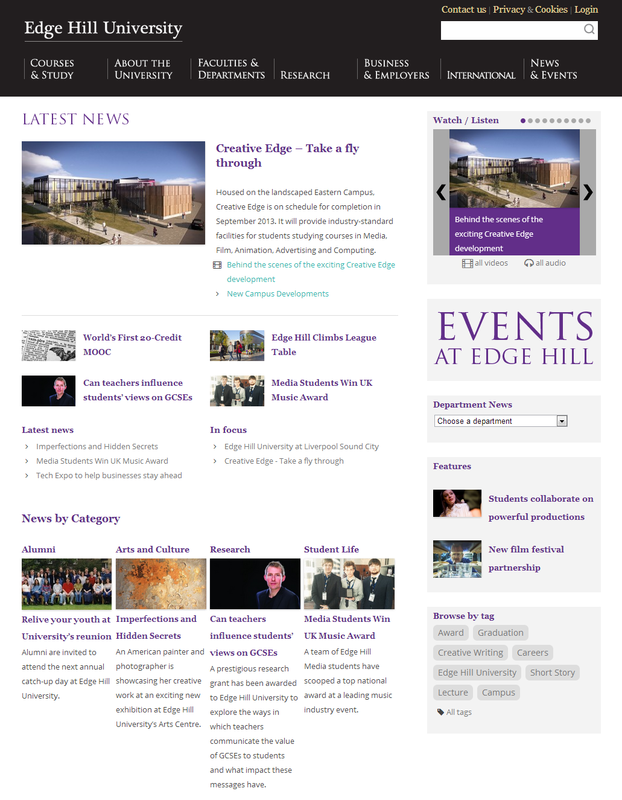 It’s a little over five years since our last major redevelopment of the Edge Hill news website when it moved from a classic ASP application into Symfony with lots of new functionality. In that time it’s been well used (and abused) with 1337 new articles plus an archive of 537 articles dating back to July 2001 imported across. News gets piped around the website with RSS feeds and machine tags to populate the homepage, department websites and various other places – it’s a bit string-and-tape, but it’s worked pretty well! Two years ago we began moving some websites to WordPress in order to devolve control of content and structure to Faculties and Departments. WordPress has proved itself a very capable content management system, but more importantly it is now a solid web development framework. It has moved beyond its blogging origins and has handled everything we’ve thrown its way. Until now we hadn’t migrated any of our “applications” (online prospectus, news, events, jobs etc) to WordPress as the cost of re-writing systems outweighed the benefit but our latest project sees us make the move with a brand new News website. While news might seem like an obvious thing to move to WordPress there were still a number of significant challenges we had to overcome in order to make the move. We also had a list of requirements from colleagues in Corporate Communications that we needed to tick off and some ideas of our own to make our news website more than “just another WordPress site”. Over the next week or so we’ll be blogging about how we built the site and some of the new features. If you work in Higher Ed Web Design you may be interested in hearing us talk about our use of WordPress at IWMW 2013 next month. Sign up for workshop session A7 – “WordPress: Beyond Blogging“!